ISIS and the spread of radical Islam pose a threat to peace in many parts of the world today. 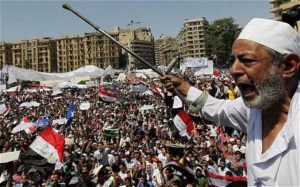 Similar movements have sprung up in other countries and the Muslim world itself is in turmoil. 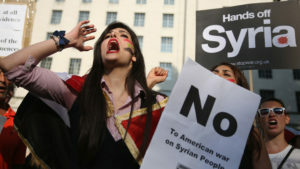 Large numbers of refugees from countries like Syria are fleeing and it is not clear who will ultimately receive them. Typical reactions in Western countries have been militaristic—more bombs and bullets. But this is a seriously misguided and dangerous approach. It is our military adventures that have caused the problem in the first place. Continuing them will only make matters worse. e caused. Worse, these efforts have mostly been counterproductive. (See a related article, The Costs of American Wars in Iraq and Afghanistan). Resentment toward us over the great amount of suffering we have inflicted actually helped to create ISIS. A second reason to reconsider is the reaction we have seen to the Arab Sp ring. We hoped it would create more democratic states in the Middle East. We thought our interventions would be helpful. But these hopes fell far short. What we are learning is that transitions to democracy from autocratic states held together by strongmen are perilous. Without a corresponding deep change in ways of thinking, they usually don’t succeed. The experiment with democracy in Iraq, for example, upset the balance of power and put Shiites in charge. They then used their new power to kill off many Sunnis. Regime changes can create more problems than they solve. 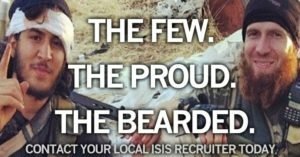 A third reason is that some of our actions here at home are directly contributing to the recruitment efforts of radical Islamist groups. Those most vulnerable to ISIS recruitment are disenfranchised Muslim youth trapped in ghettos from which they can see the prosperity of others but no opportunity to get it for themselves. Hearing anti-Muslim rhetoric from the United States and watching many US state governors close their borders to Syrian refugees crystallize in their minds that the West is the Muslim-hating villain. From there it is one short step to joining a group that promises at least symbolic victories over that enemy and glory in a reborn Caliphate. Our perspective on these issues has been shaped by our work abroad during the last 15 years. We did not intend to work with Muslims. Our original mission had nothing to do with Islamic relations. Nevertheless, through a series of remarkable incidents and contacts, we now regularly find ourselves in extensive face-to-face discussions with mosque leaders, Muslim scholars, mayors of Muslim villages, and Muslim youth. For example, in the summer of 2015 we spent three days with each of three separate groups of leaders of large Muslim communities whose constituencies number well into the thousands. For them the topic of radical Islam is far from academic. They face it regularly as radical Islamists infiltrate their own communities. It is far more of a problem for moderate Muslims overseas than for us in the USA. These experiences along with discussions with Islamic experts we have sought out in the USA have given us a somewhat unique vantage point from which to evaluate US foreign policy. Radical Islam is not embraced by the majority of Muslims. Its threats, although serious and requiring caution and vigilance, have been overstated. There is actually a way to reduce them if we act wisely and not merely react foolishly because of some recent terrorist attack (see another article in this series, How the West Can Prevail against ISIS). There is a place for military action, but it is a limited place. This is a battle for people’s hearts and minds and that can only be won by persuasion, not force. We will never be able to do that until we understand the Islamic world better, including its extremists. They are not merely thugs. They are operating out of a deeply-held religious narrative that seems as logical to them as our Western way of thinking is to us. It is impossible to destroy such an ideology by force alone. Engagement, reason, actions of practical compassion, and a visibly superior ideology are some of the needed ingredients in this battle. Fortunately, there are many people in the Islamic world that are willing to listen and to exchange ideas. We are very hopeful about our own face-to-face interactions with such people. We also hear encouraging stories from moderate Muslims about how they are dealing with radicals in their own community and the success they are having. They are the real front-line troops in this ideological war. Such people urgently need our help and encouragement—or at least for the USA to stop making their problems worse.